Children’s books and children’s television programs are two things that I’m fairly well-versed in (it just comes with the territory when you’re a mom and also teach young kids). Over the years, there have been some TV shows that I didn’t mind watching along with my son or students, and some that wore on my nerves (I’d be a terrible spy; if anyone needed to make me talk, all it would take is Barney episodes set on repeat. I‘d break long before anyone had the chance to say “Super-dee-duper!”). Then, there have been those shows that I secretly--and not so secretly--really enjoy. And on that not-so-long list is Jane and the Dragon. 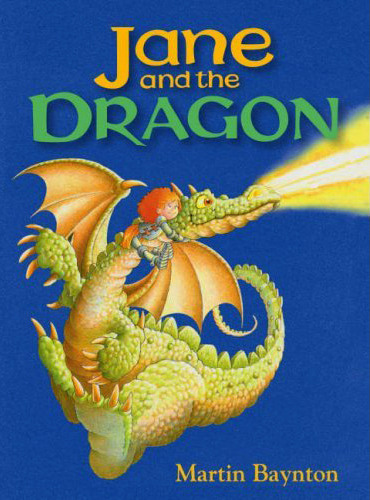 Based on the book of the same name by Martin Baynton, Jane and the Dragon is a CGI animated series produced and distributed by Nelvana, a Canadian company. Set largely in Kippernia Castle, the show focuses on Jane, a twelve year old girl who’s a knight in training, and her best friend, Dragon, who's, well…a dragon. The backstory is that Jane had been training for the traditional job a girl of her status could expect to have in the future: a lady in waiting. The TV show doesn’t elaborate on it much (only through a few lines in the theme song), but Jane wasn’t content with that lot in life, and became friends with Dragon after she went on a quest to “rescue” the young Prince from Dragon’s lair. The King was so grateful that he allowed her to start training to become a knight, and so viewers join in at that point, and get to share in all of her adventures (and misadventures). I’ll admit right away that it wasn’t a case of “love at first sight” for Jane and the Dragon and I. The animation style threw me a little bit, because the CGI was a tad too mechanical for my taste. I'm not sure if it was because it doesn’t always allow for a lot of subtleties in the characters’ expressions and so on, but it put me off at first. After giving it a chance though, other elements of the show drew me in, and my interest started to snowball. I started to enjoy the characters beyond just how they were animated. And what a cast of characters it is who live inside the walls of Kippernia Castle with Jane. The King and Queen preside, of course, along with the aforementioned Prince, Cuthbert, and his sister, Princess Lavinia, who looks up to and admires Jane. Sir Ivon and Sir Theodore are the knights who train Jane, along with her “frenemy”, another knight in training named Gunther. The rivalry between them is one of the things that provides some of the comedy and even the learning points of the show. While adults are a part of almost every episode, it’s the rest of the children and young adults who the action usually revolves around (Pepper, the castle cook and Jane’s friend; Jester, who has a secret crush on Jane; Rake, the castle gardener; and Smithy---the blacksmith, of course). Each one of them has their quirks and strengths and weaknesses, and that holds especially true for Jane. For me, there’s the appeal that she’s decided to define herself in ways that (in the fictional world of the show) go against what’s expected: a female training to be a knight, who’s friends with one of the very creatures that knights are expected to slay. This doesn’t hold true with many of the other characters who have traditional female/male roles, but that’s a different topic. Like most children’s shows, the conflict in every episode wraps up neatly by the end credits, and there’s a segment where Dragon talks directly to the “Shortlives” watching (his name for humans), reiterating the lesson learned. The conflicts aren’t always gentle or without tension though; in one episode, a lie leads to a decree that one of the characters be exiled from the castle. In another, Jane has to face down one of her fears, while also facing down a pack of wolves, no less. Still, by making mistakes but learning from them, and with guidance from the adults, Jane and the other children navigate through some universal life lessons that young viewers, and older too, can identify with. The show’s writing is witty and fun, with plenty of humor that both kids and adults can laugh at. Although my son is quick to say that it’s my “favorite show”, there have been plenty of episodes where he’s watching and laughing right along with me. There’s a dash of adventure in most of the episodes too, whether it’s a mock swordfight as Jane and Gunther train, or Jane and Dragon going outside the castle walls (Dragon flies; she goes along for the ride). The program originally aired on YTV in Canada and ABC in Australia, beginning in 2006. For those of us in the US who want to catch reruns, Jane and the Dragon plays on the Qubo channel. In the UK, it can be found on Five. To delve into the realm of Kippernia Castle in much more detail, go to www.janeandthedragon.com. And to learn more about the voice talent and other information about the show, head over to the IMDb page here: www.imdb.com/title/tt0486069.